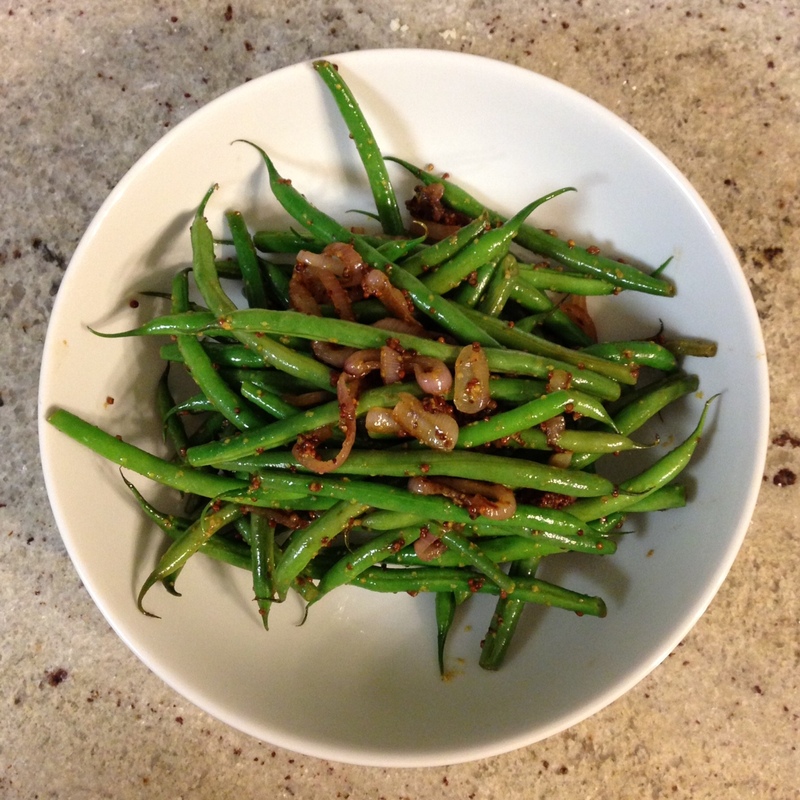 I originally made these green beans to go with the sticky honey balsamic chicken I made last week… and while they were good, they weren’t GREAT. The recipe needed a little bit of tweaking to make it perfect, but I was pretty sure I knew what I needed to do to make it work. I had my chance to try the recipe again this past weekend; my husband and I invited his parents over for dinner, as they both celebrated birthdays last week, and he suggested that his parents would love the sticky honey balsamic chicken. 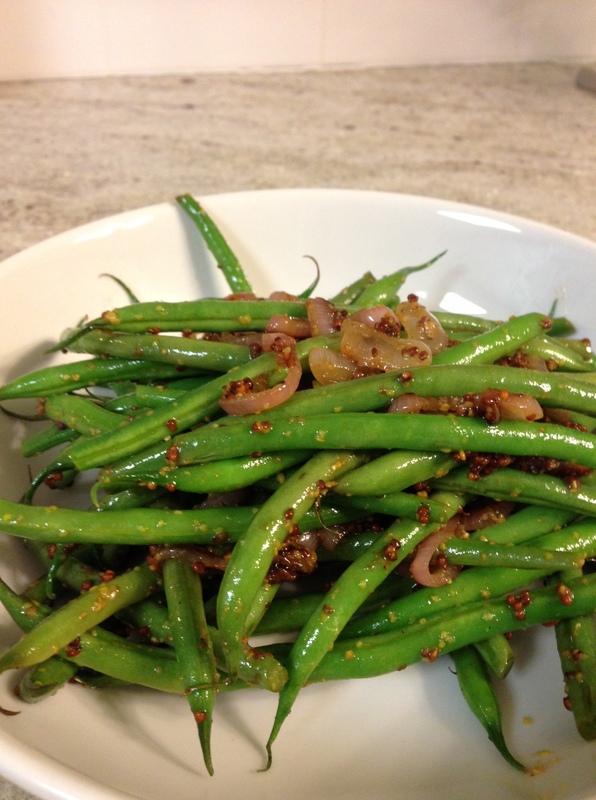 I gave the green beans another whirl, and they were exactly what I wanted them to be! 1.) Heat the olive oil in a large skillet over medium heat. When the oil is hot, add the shallots and saute until they’re soft, about 2-3 minutes. 2.) Push the softened shallots off to the side of the skillet, and add the haricot verts to the pan. Sprinkle the beans with a pinch each of kosher salt and black pepper, and toss them gently to ensure that they are all coated in oil, salt, and pepper. 3.) Continue tossing a couple times a minute for 3-4 minutes. While the beans are cooking, whisk together the whole grain mustard, honey, and apple cider vinegar. Pour the vinaigrette over the haricot verts and shallots, and toss until everything is evenly coated. 4.) Cook, tossing occasionally, until the liquid has cooked off, another 2-3 minutes. The beans should still be bright green, and fairly crunchy; serve immediately! This is a perfect side dish to accompany any meal. The beans are bright, fresh, and crunchy, and the vinaigrette adds some sweetness, some tang, and some texture. And it certainly doesn’t hurt that it all comes together in less than 10 minutes! we might need a whole grain mustard tag on the blog, to go with ina, risotto, balsamic and meatballs. HA!